Canadian Wildlife Federation: Raise a Green Roof! Roof top gardens don't spring up overnight! Create a garden that can have long-term positive results for the environment and requires lots of planning. Your task is to create a green roof that will the largest impact on the environment. Choose which materials you would use to ensure your roof is tops at fighting climate change. 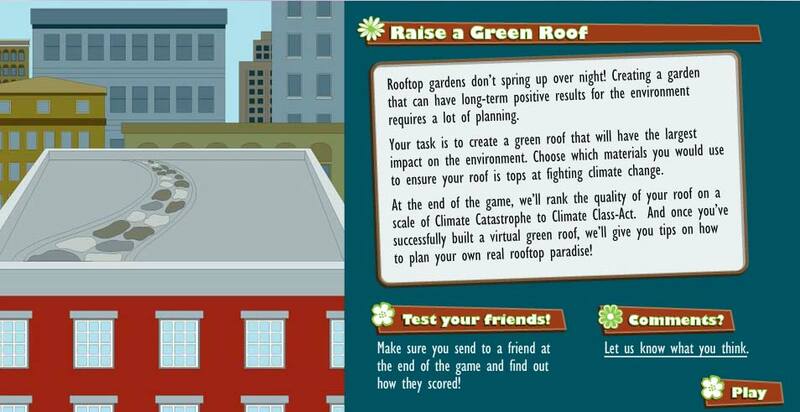 At the end of the game, we'll rank the quality of your roof on a scale of Climate Catastrophe to Climate Class-Act. And once you've successfully raised a green roof we'll give you tips on how to plan your own rooftop paradise!